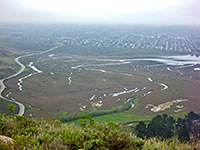 Several areas around the small coastal town of Morro Bay, beside the inlet of the same name, are managed as Morro Bay State Park, a popular and free-to-enter preserve. 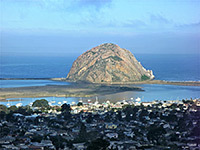 The most visible component is Morro Rock, remnant of an ancient plug volcano, which rises 578 feet above the north end of the bay at the edge of the Pacific Ocean, joined to the mainland by a narrow strip of sand. 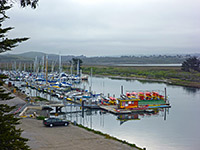 Other parts of the state park are away from the ocean, on the east side of the bay; a developed region on the south edge of town that includes a campground, marina, 18 hole golf course, natural history museum and several short footpaths around a wooded hill, and a larger, less visited section further east containing more hills and longer trails. Also included are part of the bay itself and an adjacent saltwater marsh (Morro Estuary), which supports a diverse population of birds. 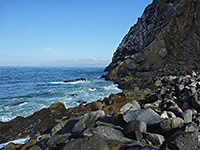 Apart from Morro Rock, however, the landscape is not particularly exciting, and most visitors are here for recreational activities, mainly camping, sailing, surfing, fishing and hiking. 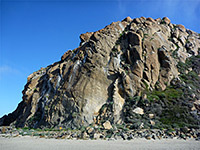 The busiest attraction in the area is Morro Rock, overlooking the shallow waters of Morro Bay to the south and a wide sandy beach to the north. The rock reached by Embarcadero/Coleman Drive in town, ending at a large parking area in front. Climbing the rock is not allowed (apart from on ceremonial occasions by the local Chumash peoples) in order to protect the peregrine falcons that roost on its slopes, and the rule is reinforced by many warning notices all around the base. Most parts are too steep to climb in any case; the easiest route would be a up a grassy gully on the south side. The peak is quite colorful, a mix of white, pink and brown, and most of its surface is bare granite. A lesser road curves round the south side to a second parking area, shortly before a southwards projecting causeway, the furthest walkable point. 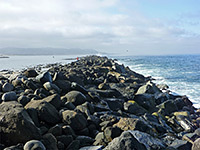 South of the rock stretches 500 feet of open water, the entrance to Morro Bay, then beyond is the tip of a narrow promontory of wind blown dunes that forms the west edge of the bay and extends 4 miles south into Montaña de Oro State Park. Morro Rock is visible from a long distance up and down the Pacific coast in this part of California, and from all over town, which is small and pretty, with no high rise buildings except for a power station with three tall chimneys, incongruously situated right at the north edge of the bay. 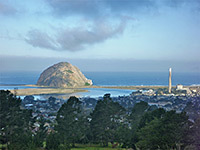 The best place for elevated views of the rock, town, bay and estuary is from the 665 foot summit of Black Hill, another volcanic outcrop, in the middle of the main section of the state park. 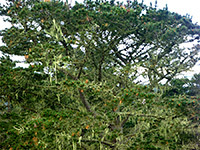 A trailhead with limited parking is situated about half way up the hill, reached by a narrow road that crosses the golf course and winds through light eucalyptus and cypress woodland, ending 200 feet below the summit. Several longer paths start hereabouts, one circling all sides of the hill. 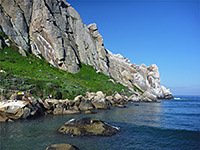 Also in the vicinity are a 135-site campground, a marina and the Museum of Natural History, this latter built on a small promontory (White Point) overlooking the bay. An adjacent, slightly higher rocky knoll has even better views of the surroundings. 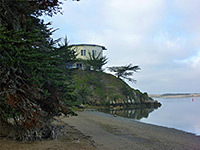 The quietest section of the preserve is to the southeast, on the far side of Bay Boulevard, the main road south, which leads to nearby Montano de Oro State Park. From two trailheads right beside the road (one with rather limited parking), paths follow valleys and climb hills including 329 foot Portola Point, close to the road, and the highest peak in the park (911 foot Cerro Cabrillo), also a former volcano.